At Greenholme Junior Middle School in North Etobicoke, a group of volunteers keep students laughing, dancing, and well fed. There are a few signs that what's cooking at Greenholme Junior Middle School is not your average hot lunch program. There's the spontaneous dancing that breaks out in line. The students returning for second and third portions of homemade meatballs and macaroni and cheese. And then there are the women volunteering in the kitchen at the school, located on Jamestown Crescent in Etobicoke, who make it all possible, so beloved by students they're often just called "Mommy" or "Auntie." 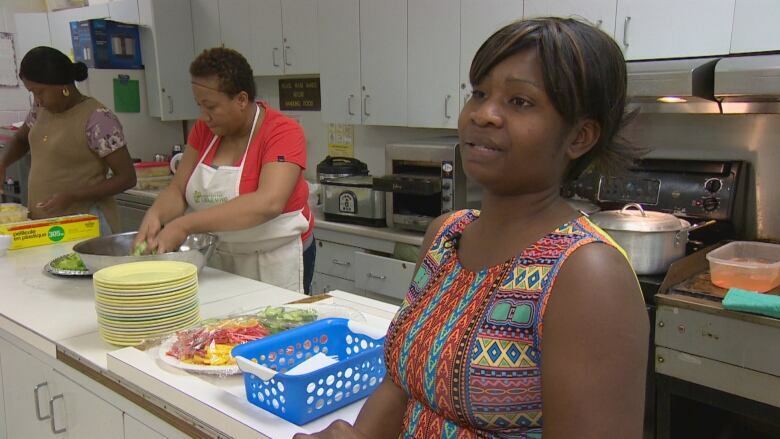 "We started February of last year charging the kids three dollars for meals every Tuesday and Thursday," said Millicent Quist from behind a giant countertop in the school's kitchen. "Since then, it's become something we're all enjoying." The hot lunch program, which now serves between 40 and 50 students, began with just a few kids clustering around Quist as she brought in food for her own children. "[They] said, 'Can't you guys just cook us a lunch in the school?'" she said. The school's principal signed off, but since the school already has a breakfast and snack program, the school's Student Nutrition Program funding was already used up, with no money left for hot lunches. In a statement to CBC News, Toronto Public Health wrote that its focus is on funding breakfast and snacks since there's evidence that it's the most crucial for student health and learning. The lack of funding didn't stop Quist. Working with the school, they decided on a $3 fee for lunch, though she says they don't turn students away who can't pay. "They will come to me, or if they don't want me to know, they will go to their teacher," said Quist, who will sometimes dip into her own pocket to make sure nobody goes hungry. On Tuesday, plates were loaded up with curried chicken, brown rice and salad. Dessert was banana bread with grapes and pineapple on the side. "The best part about it is to see the smile on the children's face," said volunteer Melissa Williams. "Coming up for second, thirds. It's amazing! It gives us joy and pleasure." The joy goes both ways. Student Maria Williams said the hot lunch program is "like a big family." "We joke around, we dance," she said. Volunteers also adjust the menu as the seasons change, mindful of keeping meals healthy. A balanced lunch "makes a big difference" by helping students stay focused in class, added Gellianne Rodney, who says the volunteers work as a team to plan the menus. Another regular fixture at lunch on Tuesdays is a neighbourhood officer from the Toronto Police Service, who dishes up food and chats with students as they eat. Identifying at-risk young people is one of the 'primary roles' of the neighbourhood officer program, according to Deputy Police Chief Peter Yuen. But Const. Jag Dhillon, scooping red peppers, cucumbers, and lettuce on to plates, says he's there to to "enhance trust with the children, and their parents, and the community." Quist says part of why she spoke with CBC is because she wants to shift the narrative about Jamestown, the northern Etobicoke neighbourhood where Greenholme is located. She says she hopes people will look harder at Jamestown — for the good of the kids she serves. "This community is not just negative," she said. "We do have good things happening."